Note: This example builds on the previous example titled: A Basic DataLogger. Only the sections of code which have been changed or added are discussed here. However, a full copy of the complete sketch can be found at the end of this page. In this example we will demonstrate the use of a RTCTimer to schedule regular events. This example builds on the previous A Basic DataLogger example, but instead of using the delay()method, it uses a scheduling timer to control the frequency of the readings. 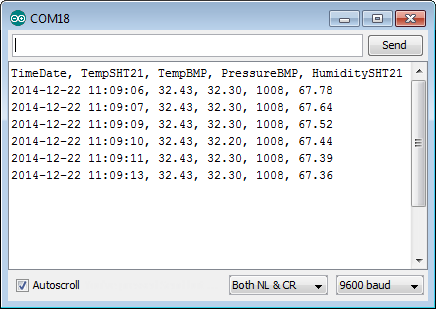 If you examine the output from the A Basic DataLogger example you will see that the actual sensor readings are not exactly at one second intervals. This is due to the use of the method delay() which pauses the execution for a specified number of milliseconds. However, since the actual time between readings is the sum of the execution time and the specified delay, this results in readings which in this case are taken at intervals of longer than one second. The RTCTimer library provides the functionality for scheduling specific methods at fixed intervals. Here we will modify the A Basic DataLogger example to take the sensor readings using a method which is called at fixed intervals by a RTCTimer object. 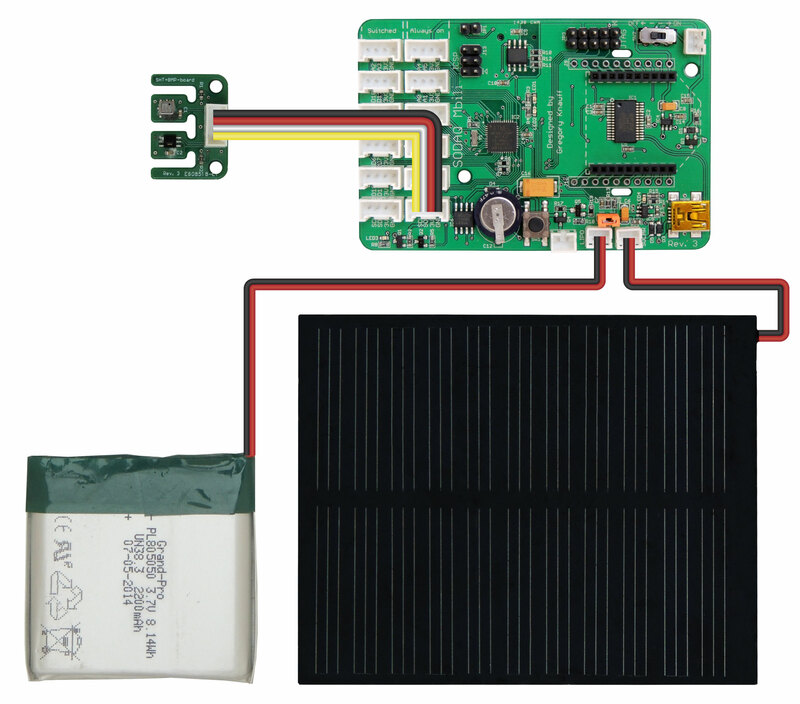 The RTCTimer library is included with the SODAQ Mbili files that you have already installed. In addition to the existing libraries, we must now also include the RTCTimer library in the sketch using the #include compiler directive. In addition to the existing Globals we declare a RTCTimer object. In addition to the existing setup code, we make a call to the user defined method setupTimer()which handles the initialisation of the timer and the scheduling of the main datalogging method takeReading(). We also make a call to takeReading() to take first sensor reading immediately instead of waiting for the first scheduled reading. The main functionality of this sketch is handled by the scheduled callback methodtakeReading(), which is called automatically at a scheduled interval. Here in the loop() method all we do is make a call to RTCTimer.update() which updates the timer object and ensures any scheduled events are called if they are now due. This method is scheduled to be called automatically by the timer object. It is scheduled to be called every READ_DELAY number of ticks. In this particular setup each tick is equal to one millisecond. Here we start by getting the sensor readings with a call to the user defined methodcreateDataRecord() which returns us a String containing the current sensor readings. We then pass that String to the user defined method logData() which writes it to the log file. We also send the data to the Serial Monitor using the Serial.println() method. Here we schedule the takeReading() method to be called every READ_DELAY number of ticks. This is done by a call to the RTCTimer.every() method where the first parameter specifies the number of ticks between each call to the method specified by the second parameter. This method is called by the RTCTimer object to update its current time reading. Here we use the method millis() which returns the number of milliseconds which have elapsed since the current sketch began. Note: In this example one tick or one increment to the time value is equal to one millisecond. It is also possible to use one second intervals by using readings from the Real Time Clock. Just remember that the scheduled callbacks will be called after the specified number of ticks have elapsed regardless of what unit of time that equates to.